SupportSync is a product return management solution designed to manage all aspects of product support including customer service, RMA (return merchandise authorization) and testing. The platform helps small to medium-size businesses handle and track returns, view customers’ service history, and gain insights on reasons for returned products. SupportSync’s returns management system provides organizations with all the tools needed to process returns from start to finish. Users can view the status of the entire returns operation including returns tracking, parts requests, testing, and reports. Search capabilities enable users to find anything from customer information to reference numbers. Reports provide insight on why products are coming back, alongside product failure trends and average turnaround times. SupportSync’s customer service portal is fully customizable and can be styled to match the branding of a company’s website, including a logo, custom text, links and images. The self-service portal enables customers to login and submit support cases, request a return, and track status on shipments. Optional case functionality includes a forum for troubleshooting issues with customers to prevent returns before they happen. Additional features include email notifications for customers, and flagging and alerts for teams. SupportSync’s integrated shipping feature enables users to print labels and track returns and shipments using UPS, FedEx, or Endicia (USPS) accounts. Features include address verification to avoid costly re-shipments, preset packaging, and more. Users can generate prepaid labels that can be emailed to customers directly, as well as batch process various types of shipments. while it makes it easy to keep track of returns it is also a little confusing. there are a lot of features but they dont tie together as easily as they could. Right place at the right time with all the right features. Just when we needed to find a simple RMA system without any of the bells and whistles that other competitors provide, we stumbled onto SupportSync. While the app was still in its early stages when we started, it was still very functional. Additionally, Jeff and Scott were so hands-on that all our concerns were quickly addressed. It's been just under a year since we first started using SupportSync, and we definitely will be sticking with it. What would have normally been easily a few thousand dollars to develop an internal system has been solved by SupportSync with affordable subscriptions. A valuable CRM tool we used to track and manage returns between our service center and clients customer service. Being able to print shipping labels from UPS, Fedex and USPS (via Endica) directly & send email notifications was ideal. We also used the additional features in monitoring returns tested, retail open boxed returns and shipments of spare parts for end-users. SupportSync customer service was great when it was requested to add the additional feature in supporting for multiple brands/products to multiple service centers. We have been using Support Sync for about 2 months now and are having no issues and we are very pleased with the ease of use. The shipping feature is wonderful and everything works like a charm. The customer service has been very helpful and we could not be happier. Thank you Support Sync. Basic: $175 per month (paid annually) or $250 per month (paid month-to-month). Basic plan provides access up to 5 users. Professional: $295 per month (paid annually) or $375 per month (paid month-to-month). Professional plan provides access up to 10 users. All features included on each plan. Plans vary based on use requirements. SupportSync's self-service customer portal enables customers to efficiently contact organizations, and get status updates on cases or shipments. The system includes a customer portal and CRM functionality, as well as integrations with the major freight carriers. Users can run comprehensive reports on returns, parts requests, testing, cases, shipping, user activity and more. Organizations can view customers' entire service history to identify whether a customer has had too many returns and may require special service. SupportSync’s flexible process flow can be tailored to match the company’s return policy. Below are some frequently asked questions for SupportSync. Q. What type of pricing plans does SupportSync offer? Q. Who are the typical users of SupportSync? Q. What languages does SupportSync support? Q. Does SupportSync support mobile devices? Q. Does SupportSync offer an API? No, SupportSync does not have an API available. Q. What other apps does SupportSync integrate with? Q. 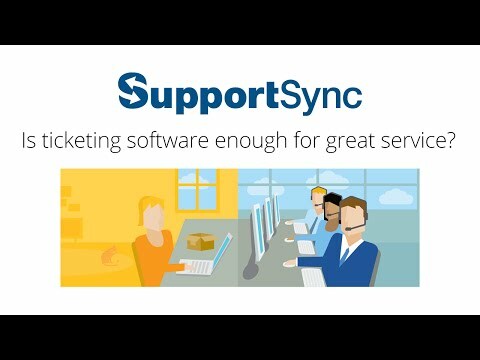 What level of support does SupportSync offer?